Pure Vermont Maple Syrup that is! When I moved to Northern Vermont in the early 70's I helped some of the local sugarmakers (as maple syrup producers are called) each spring. 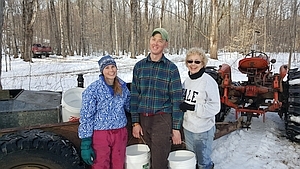 There is never a shortage of sugarmaking tasks during March and an offer of help is never turned down. After I re-settled in Southern Vermont I helped Leon Edgerton, my neighbor, mentor, and native Vermonter, to make syrup every spring. Leon's dad tapped these trees for the first time in 1938. Our gathering tanks and filter tank have been in use every year since then. 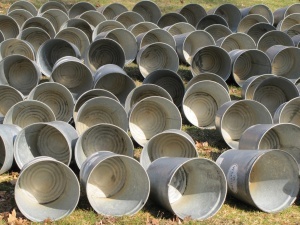 At one point Leon and I were hanging around 2,000 buckets. I can tell you honestly that keeping ahead of that many buckets is a lot of work when the sap is running strong. After many years of learning at the elbow of a master the reins were turned over to me with typical Vermont efficiency. Leon said "Now I help you" and that was that. Leon died in 1997 but the tradition of syrup making continues in our family as a rite of spring. 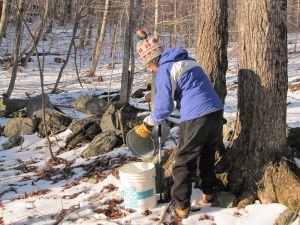 Although some taps are now set up with plastic tubing I still hang over 250 buckets so local kids can help gather sap and get a 'real' feel for this long time Vermont activity. 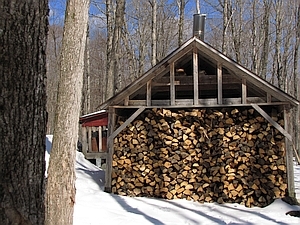 We are blessed with a south facing sugarbush on gently sloping land with towering maples that are hundreds of years old. The roots are firmly planted in the marble for which this area is famous. The result is a perfect combination of factors that allows us to produce some of the best tasting maple syrup you will find anywhere. As sugarmaker I would love to take credit but it is mostly the quality of the trees and the soil. On the other hand sap is a perishable product so we endeavor to boil the sap down to syrup within a few hours of gathering, so it is not all the trees! 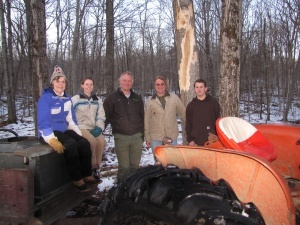 I am a member of the Vermont Maple Sugarmakers' Association although we are not a big operation and do not make a lot of syrup. Like many of Vermont's small producers we take great pride in the quality of what we do produce. True to tradition, every year there are a few close friends who come out to help along with daughters pressed into service. Sometimes one of Leon's sons will drive from one and one-half hours away to help gather and re-kindle his connection to these trees. Once you get a little sap running in your veins it is hard to escape the draw when the strong sun of late February starts warming things up and the air smells just right. Setting out taps is the first promise of spring after a long cold winter. 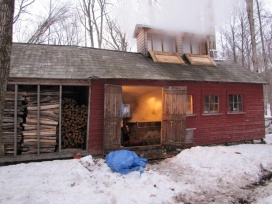 Weather, sugarbush, and to a lesser extent the experience of the sugarmaker dictates the grade of syrup produced. The history of the grading system is interesting. In the days of the colonies, England controlled the market for white cane sugar and it was highly taxed in the colonies. Maple sugar was a locally produced alternative. The lightest colored sugar was highly prized in the cities as it was the closest approximation to white cane sugar. As a result the lightest grade with the most delicate flavor was called Fancy. Recently Vermont adopted a new grading system: Golden Color with Delicate Flavor (Fancy), Amber Color with Rich Flavor (similar to Grade A Amber), Dark Color with Robust Flavor (similar to Grade A Dark), and Very Dark Color with Strong Flavor (similar to Grade B). 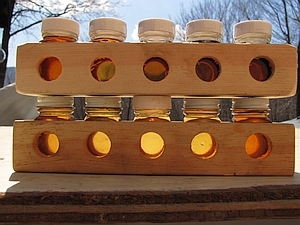 There is no difference in the quality of the syrup between grades except for the subtle differences in flavor and color. Among our customers we have advocates that insist their favorite grade is "the best". In the end it is a personal preference. 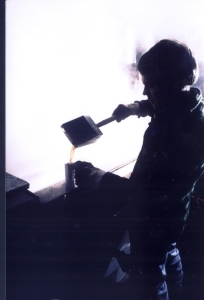 In a normal season the first runs produce the lightest syrup. 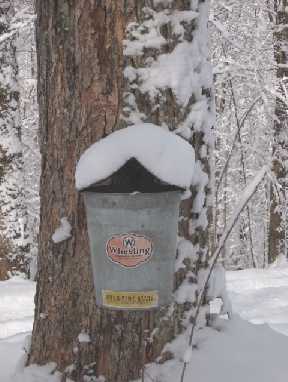 As the season progresses the syrup will darken and take on a more robust flavor. When the buds swell in late March the syrup season is generally over for us. Every season is different. In most years we make Golden Delicate and Amber Rich. Every couple of years years we will also make some Dark Robust. Infrequently at the end of the season there may be a limited amount of Very Dark Strong. There are many cooks that prefer Very Dark in their recipes because they feel the more stronger flavor gives their dishes more of a "maple" flavor. I have a few customers that have a standing order for Very Dark whenever I have any. Our Amber Rich and Dark Robust grades are very similar in flavor and primarily differ in color. I guarantee you will be delighted with the flavor of any syrup we make. We ship to customers customers from all over the US. We would be delighted to ship syrup to you -- as long as we are not already sold out of this year's crop. All Syrup is put up in colorful plastic jugs. Prices do not include shipping. Syrup is heavy so shipping can range from approximately $6.00 to $14.00 per container or more depending on container size and your location. We will quote you shipping at time of order. 2018: A very early start in Vermont near the end of January with extremely low sugar content in the sap. Since we do not use reverse osmosis to concentrate sap before boiling we decided to wait to tap out until the sap sweetened. Then the weather turned very cold for more than a month. We tapped March 17/18 and our first boil was March 26th and our last was April 10th. 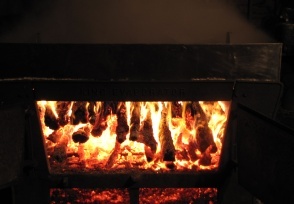 Some years our last boil is the third week of March! Produced some of the lightest syrup We've ever made follwed by wonderful Amber Rich and a little Dark Robust, all with excellent flavor. Copyright © 2018 de Rham & Company, Inc.